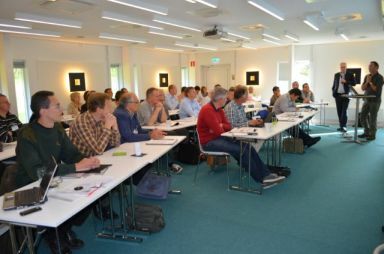 Every year Wageningen Economic Research (formerly known as LEI) organises the Pacioli workshop on the collection and use of farm level data for policy analysis, research and extension. An example of such a farm level data system is the European Farm Accountancy Network (FADN). Pacioli is the international workshop for innovations in micro-economic databases in agriculture. FADN coordinators, experts and researchers attend this workshop to discuss new developments in data collection, data requirements and research on farm level data sets. The workshop provides a source of inspiration for their day to day work and gives the opportunity to establish contacts in and outside the European Union. Pacioli is the international workshop for coordinators, experts and researchers on farm level databases in agriculture, such as FADN in Europe (Farm Accountancy Data Network). It provides a platform to discuss best practises in data collection, data management, data use and data dissemination. This edition will take place in Prague, Czech Republic. The previous 26 workshops turned out to be very useful events for professionals: they experienced a source of inspiration for their day to day work and to establish contacts in and outside the European Union. You may consult our website for the presentations during the previous meetings (www.pacioli.org). The environment in which FADN operates is changing. The Common Agricultural Policy (CAP) will include more environmental and climate ambitions. At the same time also the farming sector is changing due to an increased scale of production and an increased complexity of farm holdings (for example legal structures with several locations and more complex relations between owners and managers). This makes data collection more complicated. Developments in ICT provide a huge potential to innovate and increase efficiency of data collection. The workshop will be held from Sunday evening 6th of October till Wednesday 9th of October (at noon). The event will take place in Prague. Prague is the capital and largest city in the Czech Republic, situated on the Vltava river. The city is home to about 1.3 million people. Prague has been a political, cultural and economic center of central Europe with a rich history. Prague is home to a number of famous cultural attractions, such as Prague Castle, Charles Bridge, Old Town Square with the Prague astronomical clock, the Jewish Quarter, Petřín hill and Vyšehrad. Since 1992, the extensive historic center of Prague has been included in the UNESCO list of World Heritage Sites. The participation fee is Euro 895 (excl. VAT). This includes workshop fee, refreshments, meals, hotel room for three nights and excursion. Participants will receive a binder with papers presented. To be able to make all further reservations, we ask you to fill in the registration form before 17th of July 2019. The registration will open 15th of May, the link to the registration form will be provided at www.pacioli.org.